Bengal is a semi-modular synth, meaning that although its component modules (operators, filters, etc) are all fixed, they can be patched together in a huge range of configurations in the giant Patch panel at the bottom. Connect square output sockets to round input sockets by dragging virtual patchcords between them – it couldn’t be easier. Bengal is also eight-voice polyphonic, so it’s just as at home blasting out huge chords as it is one-finger basslines. Each of Bengal’s four operators generates its waveform using a bank of 20 editable sine wave partials or a wavetable – over 40 are included, and external samples can be imported by dragging and dropping them directly into the GUI. 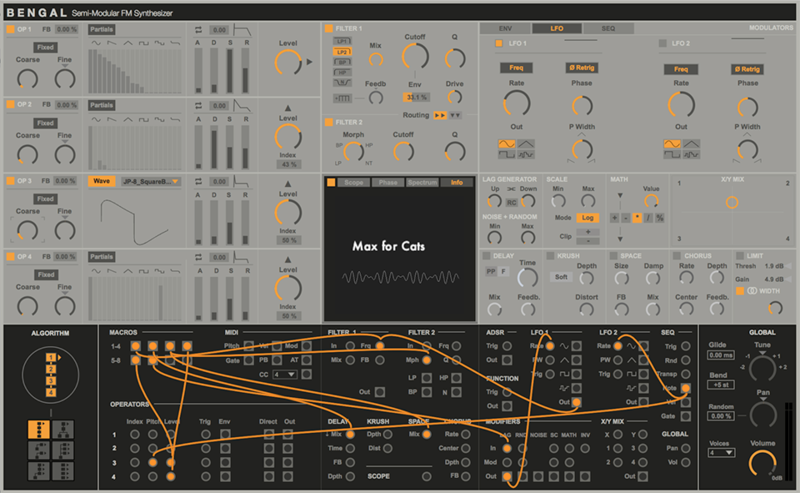 Independent ADSR envelopes with Curve shaping and optional Looping are also in place for every operator, along with Feedback controls for really making them scream. The modulator/carrier routing is chosen from a selection of six FM algorithms, giving access to a variety of sonic starting points right out of the gate. Bengal gives you not one but two multimode resonant filters. Filter 1 offers a choice of five switchable types – Moog-style ladder Lowpass, regular Lowpass, Highpass, Bandpass, Notch and Comb (with adjustable bipolar Feedback) – as well as Drive and wet/dry Mix controls for dialling in analogue-flavoured saturation and parallel processing, respectively. Filter 2 can be placed after Filter 1 in the signal flow or fed in parallel with it, and morphs smoothly between Lowpass, Bandpass, Highpass and Notch types. Modulation is key to Bengal’s architecture and sound. Running from 0.1Hz to speeds in the audible range, the two LFOs serve as regular parameter modulators or additional FM sources, while both the six-segment Breakpoint envelope and ADSR envelope can be looped and curved. The eight-step sequencer’s no slouch, either, outputting MIDI notes or modulation data, and featuring scale snapping, swing, and randomisation of pitch and velocity. For even more movement, Bengal’s four Modifiers let you mess with its modulation signals in various ways, including smoothing, scaling, applying mathematical functions, and four-way mixing. There are also six audio effects onboard – reverb, delay, distortion, chorus, limiting and stereo widening – for processing and polishing prior to the final output. With more than 50 modulation source parameters and 60 targets available, Bengal makes assigning the two easy and creatively rewarding with the Patch panel. Simply drag virtual cables from sources to targets as you see fit – each connection point can accept multiple cables at once, so you can really go to extremes! Occupying the centre of the Bengal interface, the Visual Control Panel gives graphical feedback on the signal from any point within the synth, as set in the Patch panel. In Scope mode, the Panel shows the signal as a waveform; in Phase mode the stereo width and positioning are visualised; and in Spectrum mode, a sonogram reveals the frequency/energy distribution – three ways to skin a big cat, you could say.